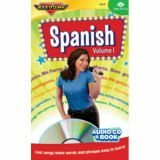 Everyday Words in Spanish/Palabras de todos los días flash cards offer children an easy way to practice vocabulary in both English and Spanish. Educational flash cards are an excellent way to introduce basic skills, reinforce memorization, and support good study habits. This two-sided card set features rounded corners for easy sorting and includes 104 set cards (6" x 3" each) and 1 resource card. Laminated 2-1⁄2"H cut-ups. Essential greetings, replies, terms of politeness, color-coded by groupings. An excellent way to build conversational skills. Feature one at a time or make a word wall. 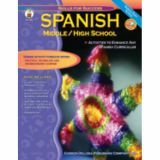 Includes 50-page activity resource. 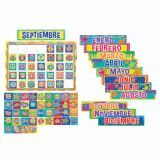 The fast-paced fun of Word for Word® Phonics Game is now available in Spanish! Using all 4 sides of their Reading Rods®, players build as many words as they can in 2 minutes. Players may exchange Rods with the center pile as needed. When the time is up, switch Rods with their neighbors and keep on building! Score extra points for using more than 2 Rods in any word. 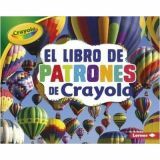 Includes 126 color-coded Rods, score pad, pencils and 2-minute timer. 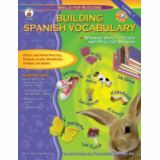 Compatible with our Spanish Reading Rods® Fonetica y Vocabulario products. 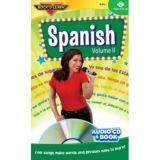 Audio & DVD Programs Volume I teaches greetings, expressions, numbers, colors, parts of the body, food and more. 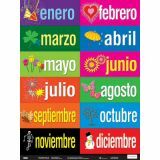 Volume II teaches subject pronouns, telling time to the hour, the calendar, “question words,” directions and more. Special delayed format for self-testing. Audio includes CD and an illustrated book. Here's the easy way to learn greetings, counting, colors, survival phrases, subject pronouns, travel phrases, and more. Energetic performers entertain and motivate while delayed answers make it easy for students to check their progress. Approx. 55 min. Ages 6 & up.